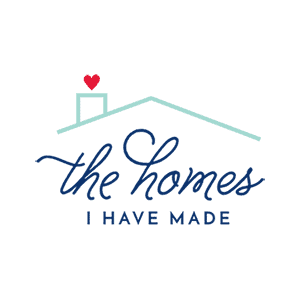 I’ve mentioned a few times here and there that I’ve been on a major decluttering and organizing spree in our home. Just in the past 6 weeks, I’ve taken on the playroom, my office/craft room, under the tv cabinet, our Lego collection (again), our files, the freezer, and the pantry (phew!). Before I start sharing all these projects with you, I wanted to take some time to fully outline the process I use over and over to conquer any amount of clutter…whether it’s a single drawer or an entire (overstuffed) craft room…and create a truly functional end result. Readers who have been following along for a while probably already have a sense for my process…and those who have taken my Conquer Your Kitchen Crash Course will know it by heart…but I’ve never actually hashed it all out for you here. 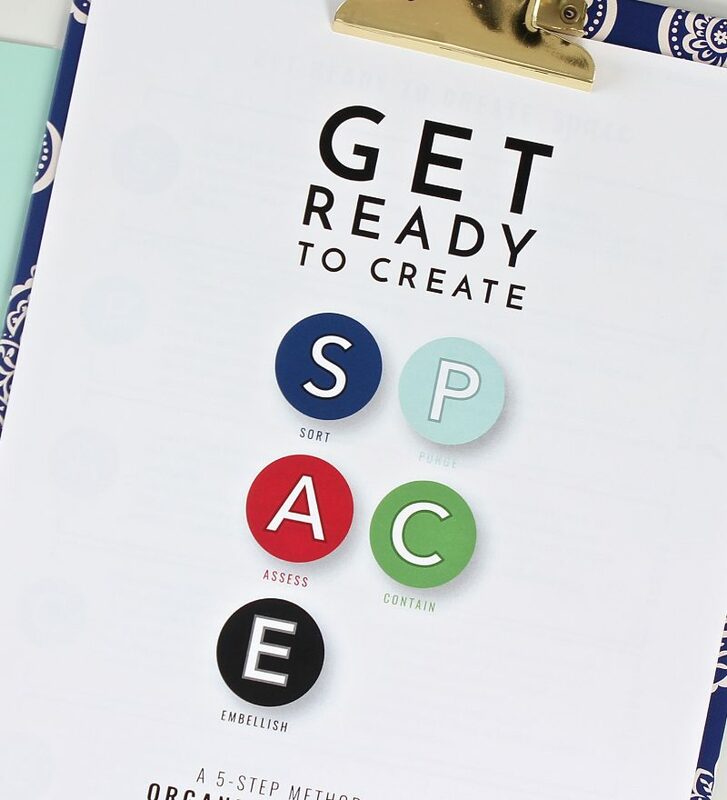 So today I’m going to show you my method for organizing any space, and I’ve even repackaged some of my favorite organization worksheets to help you conquer the clutter too! Let’s get started! 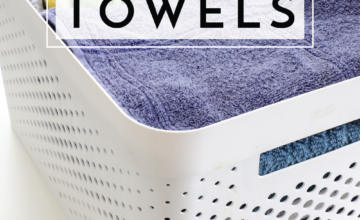 I’ve noticed that when most people decide to tackle a clutter problem, their first instinct is often to go load up on baskets, bins, files and other organizing supplies at their favorite shopping spot. They return home with their fancy new supplies, sort their stuff, and put all their items away in a new and likely-prettier home. My friends, this isn’t organizing. This is finding pretty ways to store your clutter. Truly organizing a space is so much more than sorting items into pretty containers and adding labels. It’s about assessing the importance, function and usability of your stuff; deciding how much stuff can reasonably fit into the space you have; identifying systems to make that stuff usable; and (if desired) adding pretty details to help you love and stick to your new systems more. The process starts with making a bigger mess than you started with, and it actually finishes with the pretty baskets and labels. I settled into my 5-step process years ago and have been using it ever since, but in recent years I identified a snazzy little acronym to help others (like you guys!) stay on task and make the most progress possible when decluttering and organizing. It’s pretty easy to remember and very intuitive. Come on, my friends, let’s make some SPACE! The very first step in any organizing project (big or small) is to empty it all out. 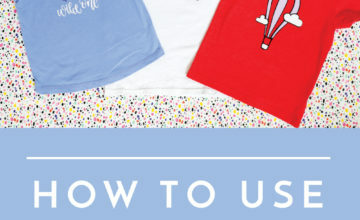 Yep – every.single.thing. All of it. Leave nothing behind. Sure, this may be easy if you’re organizing a single shelf or drawer, but it can create quite the disaster if you’re tackling a large space like an attic, garage, playroom or workshop/craft space. Although you may be tempted to work in chunks/zones, I strongly recommend emptying out the entire space if you can manage it. Setup work tables, work on a nice day where you can put things outside, or use un-used rooms to hold everything while you work. 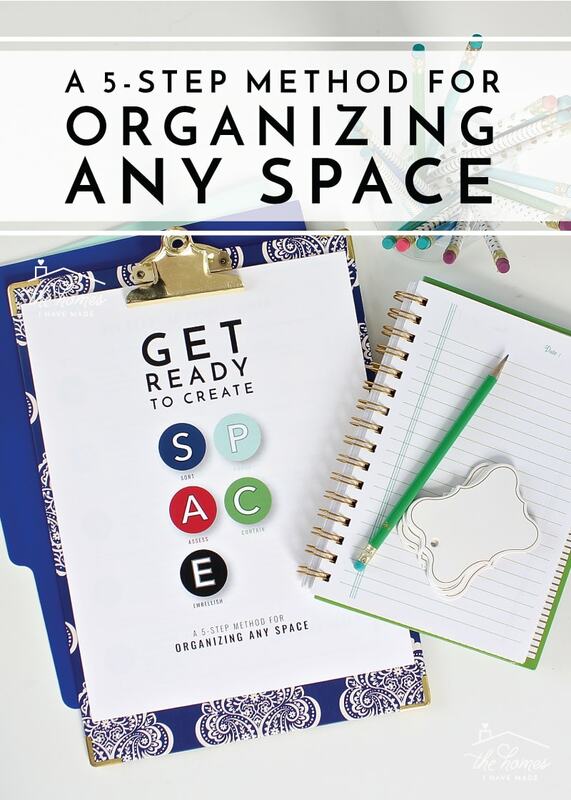 Not only does creating a huge mess motivate you to deal with everything as quickly as possible, but it’s really the only way to fully assess what you have, make decisions about what to keep, and determine how best to re-organize your space moving forward. Think about it: there is no point sorting through, purging and organizing your coffee mugs in one cabinet only to discover days or weeks later that you have a bunch more under the sink. Empty it all so you can see everything you have; and as you empty, sort things into piles of like items or general categories. Don’t over-analyze, and don’t get bogged down in making decisions on each item now. Your goal is to empty everything and put like items together so you can easily identify quantity, duplicates, purpose, quality, and value in the next step! This second step will likely be the hardest for you, especially if you tend to have emotional attachments to your things. Now that your target area is empty and each items is loosely sorted into general categories, it’s time to visit each pile one at a time and assess every item individually. Now is when you will determine which of these 5 categories each item falls into: Keep Here | Keep Somewhere Else | Trash | Donate | Sell. Depending on how much stuff you have and the amount of space you have, you may have to be pretty ruthless with yourself. 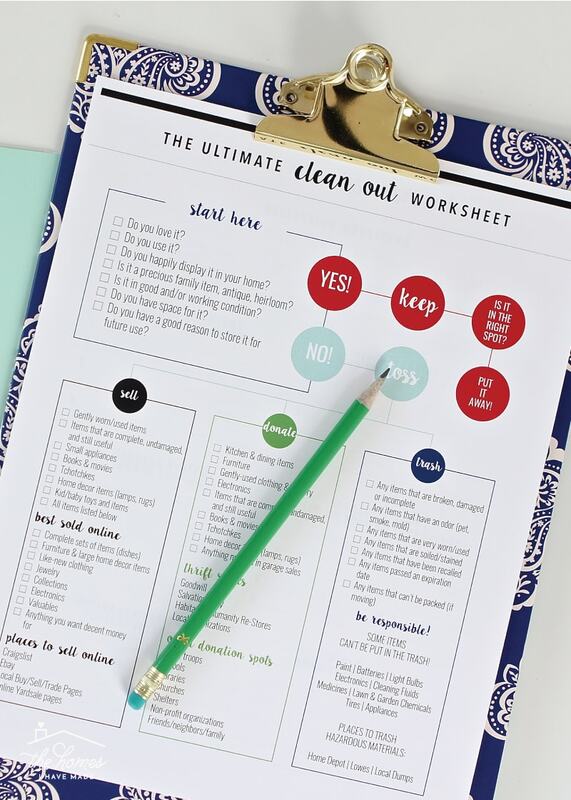 Use my Ultimate Clean Out Worksheet (included in this download) to help you work through tough decisions. Before moving on, go ahead and get rid of the Keep Somewhere Else, Trash, Donate and Sell piles. Put away items that don’t belong in your target area, place trash in the trash, load up the car to go to the donation center, and box up/store items to be sold at a later date. Not only does moving discarded items out right away keep you from second guessing your decisions, but it will visually reduce the amount you have leftover to deal with. This alone can be very motivating, especially if you had a doozy of a clutter situation at the start! What was previously working? What was previously not working? What items should be stored together? Where do items function best? Where do items fit best? Where do you commonly use items? What storage systems are needed to make the space function better? It is during this assessment phase that you will begin to identify where exactly items should be placed and how best they can be stored. While you don’t need to put items away just yet, you will likely find yourself moving items around your space over and over in order to try different options. It is also helpful to take measurements at this stage (of both your items and your shelves/drawers/nooks), and even scratch potential layouts or placement ideas onto paper. While you are trying to identify proper homes for each item, you may realize you need to re-visit the “assess” step again. If you just cannot find a way to make the items you have fit into your space in a way that is comfortable, logical and functional, you may need to purge again in order to get your collection down to a more realistic level. By the end of this step, you should have a place in mind for each and every item, as well as possible solutions for containing and storing items (baskets, bins, files, shelves, dividers, etc) where necessary. 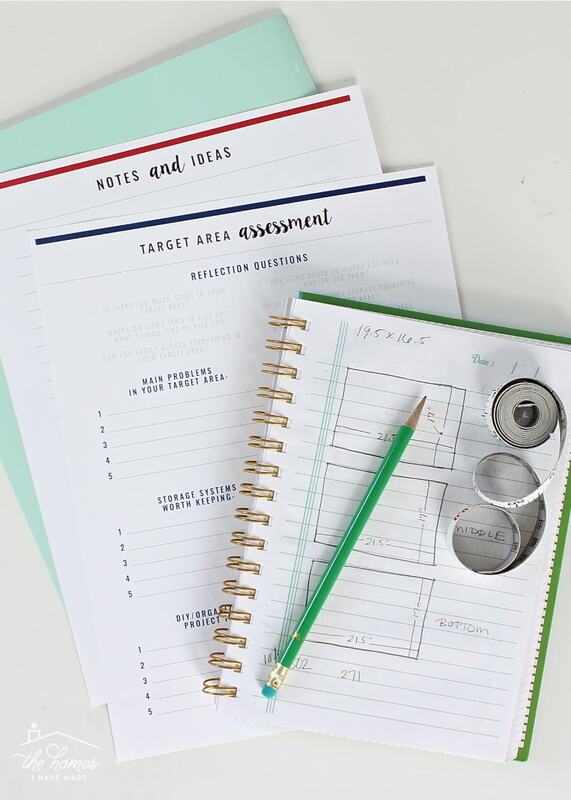 Because you have truly assessed everything you own and have identified the best way to corral and store each item, you can now create a detailed shopping list for the storage solutions you still need in order to put everything away. This next step is the most fun and where you will really start to see your efforts pay off. It’s finally time to gather some awesome organizing supplies, install systems, contain your items, and finally put things away! 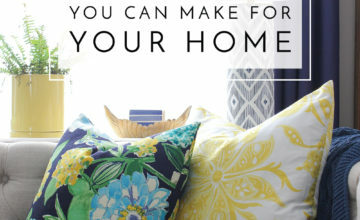 Using the measurements you noted and the list you created in the last step, shop your house or favorite stores to find the exact products you need in order to store your sorted and purged items in the most space-savvy, functional, and aesthetically pleasing way possible. Storage systems can include anything and everything from boxes, bins, files, totes, shelves, tupperwares, drawers, dividers, trays, and more. Oftentimes, patience and perseverance are necessary in order to find the exact right storage solution for your items and your space. Resist the urge to jump for just any product to do the job; if necessary, use cardboard boxes, laundry baskets, or plastic shoe boxes as placeholders until you can find exactly what you’re looking for. Does the entire item/collection fit where you want to put it? Does the item make good use of that spot? Are the items easily accessible? Are the items close to where you use them? Continue to work and refine where each item goes until everything fits, it’s all functional, and you like the way it looks. 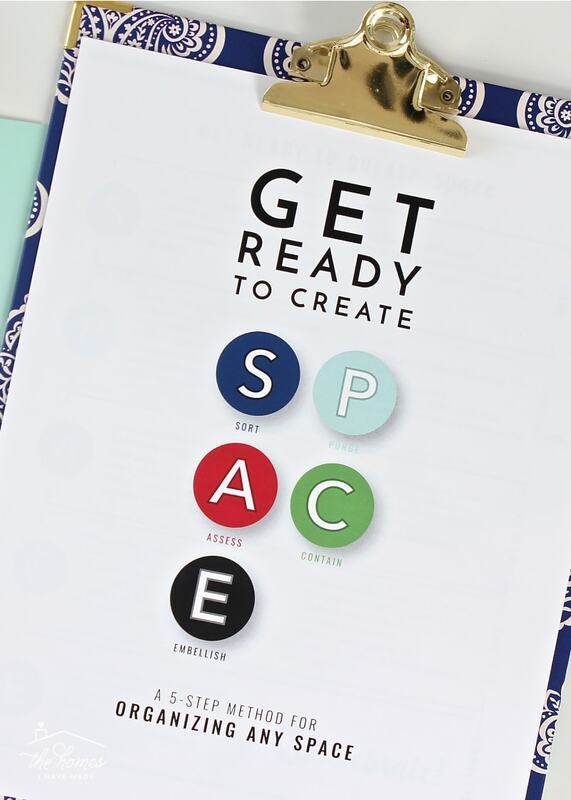 The final step is completely optional but highly recommended: embellish your newly organized space with liners, labels, and other decorative touches. 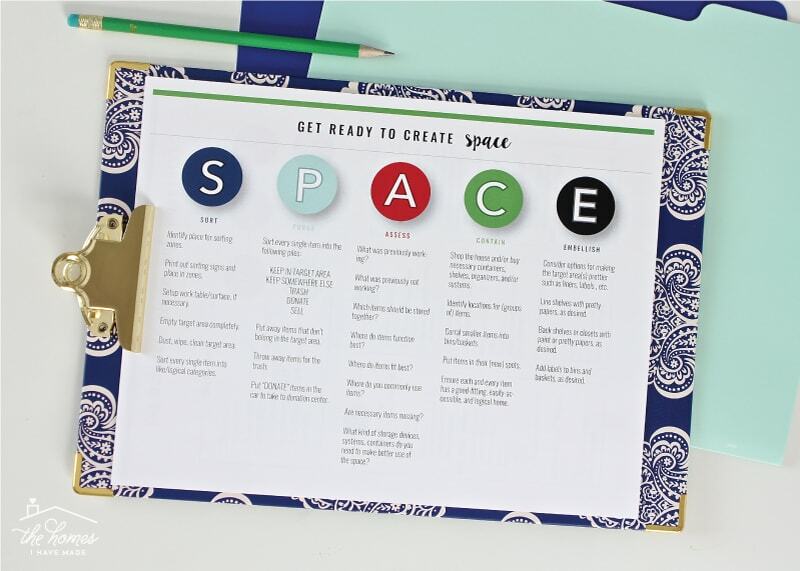 Not only do labels hold you accountable over the long haul, but decorative touches will help you honor your space more. 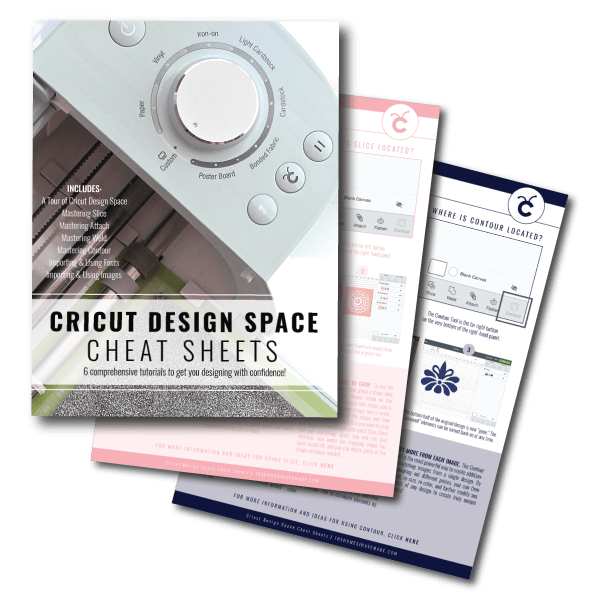 These small details don’t necessarily create a more organized result, but they will help you love and maintain the new systems you’ve put in place. 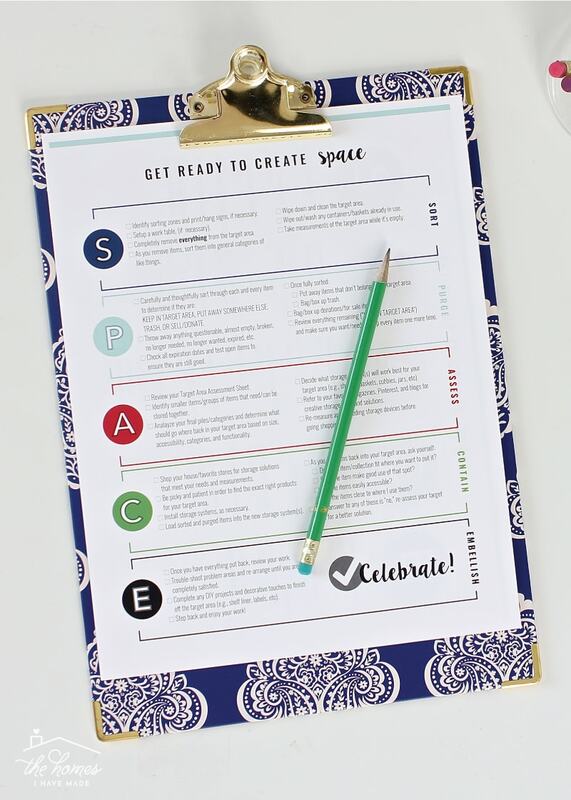 To help you work through these steps in any area of your home or life, I assembled all of the information in this post into a new 9-page printable kit (pictured throughout this post)! 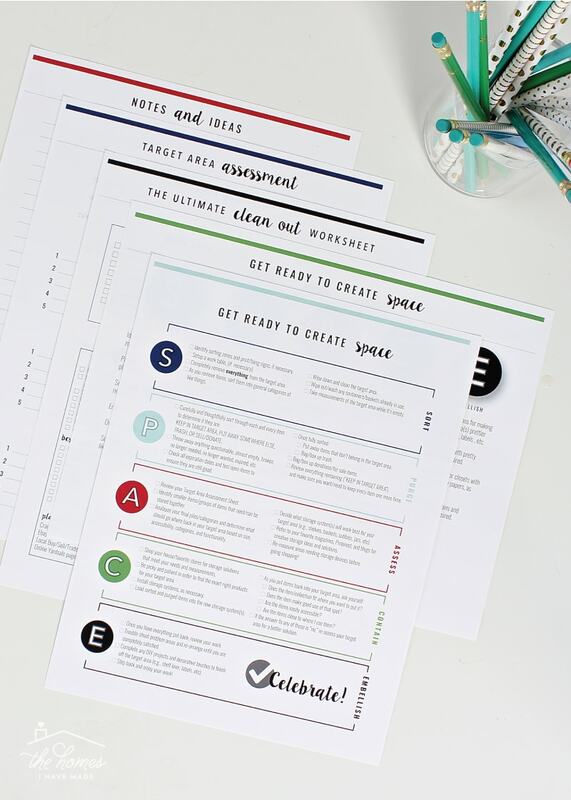 All of these checklists and worksheets have been scattered throughout some of my other kits (The Ultimate Garage Sale Kit, the Conquer Your Kitchen Kit), but I wanted to have them all together as a single, easy-to-reference pack. 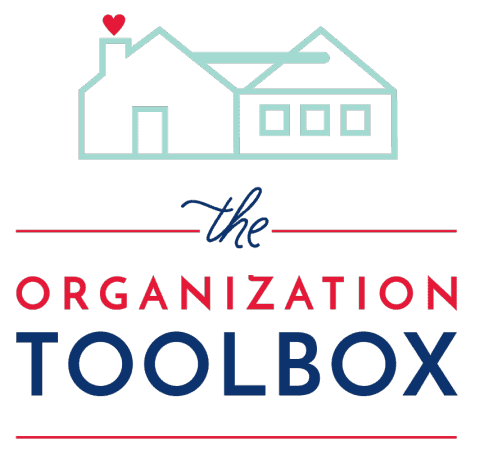 If you would like this printable kit, is is now available in The Organization Toolbox! 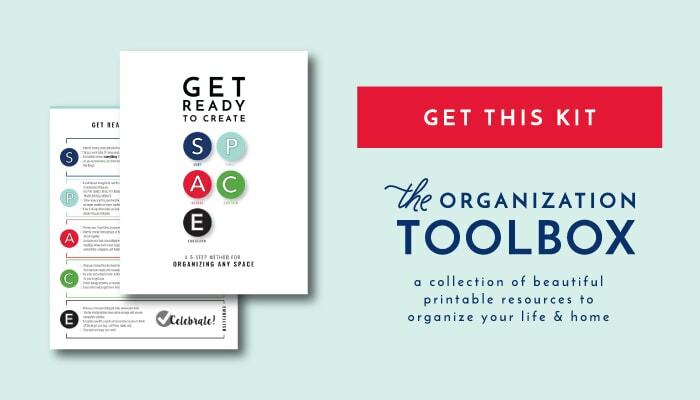 This SPACE Decluttering Workbook has been uploaded to The Organization Toolbox and is available for download right now! I genuinely hope the method I outlined here helps you tackle some problem areas around your home. 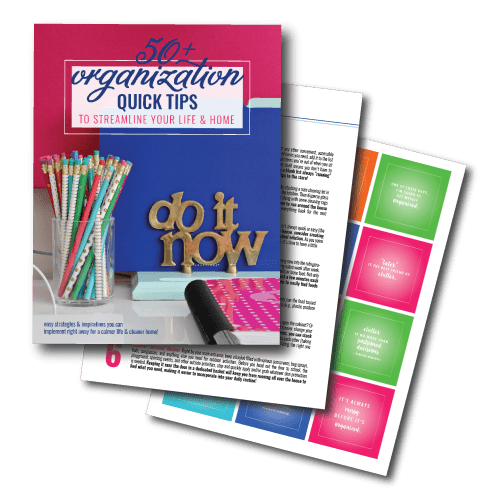 As I said before, I use this exact 5-step method time and time again…and as I start to reveal some of my recent organizing projects in the coming weeks, you will really see these steps come to life. I know it seems like a lot of steps and a lot of things to think about. But as you get more comfortable with the process, dealing with your clutter and creating truly functional spaces will not only become manageable and obtainable…but perhaps downright enjoyable! 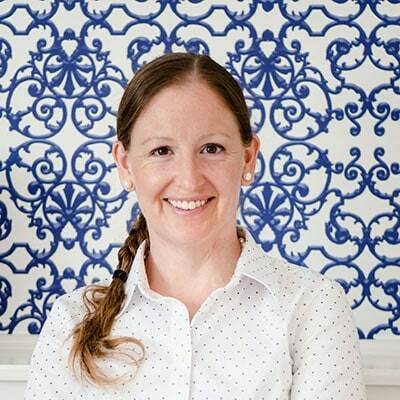 The declutter and organizing talk continues later this week! Back here on Friday, I’m going to share how I decide whether to trash, donate or sell unwanted items. It’s certainly not a one-size-fits-all decision, but I’ll share what’s been working for me in recent weeks! 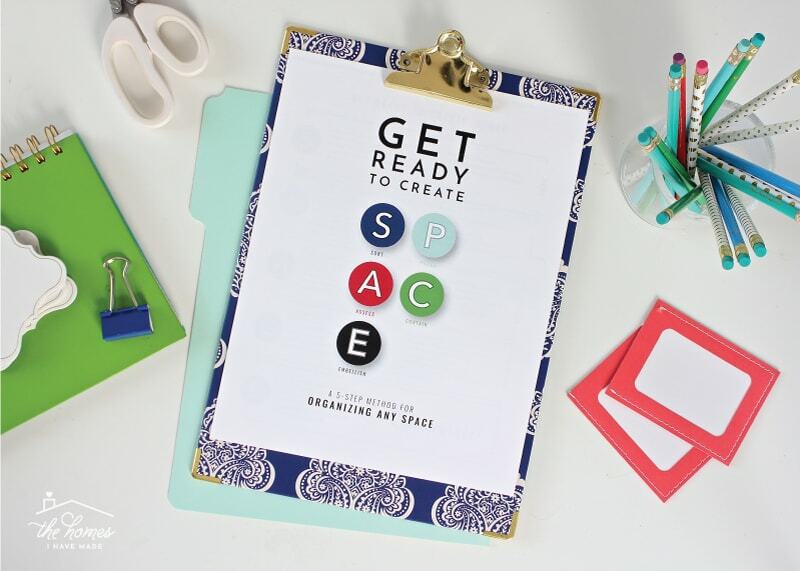 3 Inexpensive Artwork Ideas You Can Make in Minutes!